The course of our subject now leads us to the consideration of that distinguished style called the Gothic, which sprang up to adorn and dignify the history of the Art in the middle ages, and whose characteristic beauties entitle it to so high a place in the estimation both of the student and the amateur. The Saracenic which is supposed to have been the parent of the Gothic, is distinguished by the loftiness of its vaultings; the mixed forms of its curves, the slenderness of its columns, variety of its capitals, and a multiplicity of rich ornamental foliage and Arabesques. The Moorish or Mauresque, and the Arabian or Arabesque styles are simply variations of the Saracenic, and differ only in the forms of the arches and in the varieties of their ornamental foliage. These several styles appear all to have emanated from the immersion of architecture in the dark ages. The numerous varieties of Gothic have been very differently classified. For the purposes of the present summary review, we shall present the reader with two separate arrangements of the variations in style; in the first, we shall point out the leading features in the style of each age; and in the second, name those portions of the principal cathedrals or chapels in England which belong to the respective styles, adding the dates after the most approved methods. 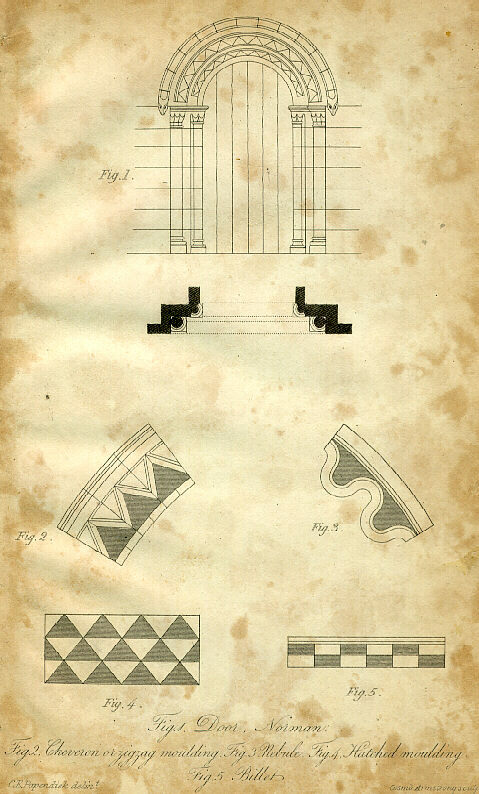 In the plates annexed, the door or window has been selected as bearing generally the most characteristic indication of the several varieties of the styles. SAXON, A.D. 597 to 1066. The walls very thick, generally without buttresses, semicircular arches, supported by heavy, thick columns; diagonal mouldings; arches springing from the capitals of the columns, without architraves. NORMAN, A.D. 1066 to 1189. Buildings of larger dimensions, plain but more lofty vaulting, circular pillars of greater diameter, capitals more elaborately worked, a total absence of sediments and pinnacles, and having the arches semicircular. EARLY GOTHIC, A. D. 1189 to 1272. The slender column, and the lancet arch; windows with three lights, and small columns as mullions. 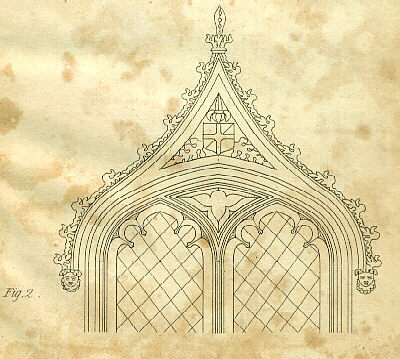 PURE GOTHIC AND DECORATED ENGLISH, A. D. 1272 to 1390. 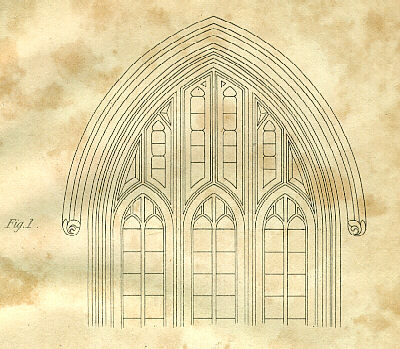 Clustered columns of more slender proportions; the window heads ramified into many intersections with trefoils, quatrefoils, cinque foils, etc. ; the roofs ornamented with tracery. FLORID GOTHIC, A. D. 1390 to 1547. The flat or compound pointed arch; the roofs much ornamented, the proportions very lofty. The pinnacles, canopies, etc. 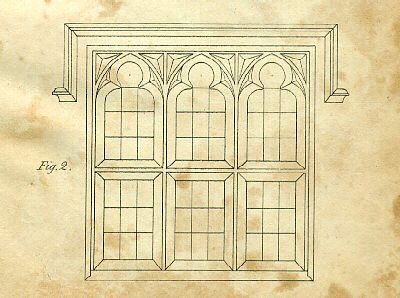 highly enriched; an exact adaptation of the groins of the vaults to the heads of the windows. The second mode of classing the styles and dates. The portions of buildings underneath mentioned are considered as belonging to the respective styles, for the chief features of each of which the reader is referred to corresponding dates in the preceding arrangement, where we have particularized the more important and striking peculiarities of each era. From 1100 to 1170 including the reigns of Henry I. and Stephen. Cathedral at Rochester, west front and nave. Cathedral at Gloucester, nave, north aisle. Cathedral at Exeter, transept towers. Cathedral at Ely, north transept. Cathedral at Lincoln, older part of west front and central tower. Cathedral at Durham, entire church. 1170 to 1220. Henry II, Richard I. John. Cathedral at Ely, west towers and nave. Cathedral at Canterbury, choir, tower called Becket's crown. Cathedral at Oxford, nave and chapter house. Cathedral at Norwich, nave and choir. Cathedral at Wells, nave and choir begun. 1220 to 1300. Henry III. Edward I.
Cathedral at Lincoln, nave and arches beyond transept. Cathedral at York, north and south transept. Cathedral at Westminster Abbey, uniformly. From 1300 to 1400. Edward I. II. III. Richard II. Cathedral at Exeter, nave and choir. Cathedral at York, nave and west front, choir. Cathedral at Gloucester, transept, cloisters begun. Cathedral at Norwich, spire and tower. Cathedral at Ely, Our Lady's chapel. Cathedral at Oxford - Merton College chapel, New College chapel. Cathedral at Westminster, St. Stephen's chapel . ORNAMENTED GOTHIC, AND PERPENDICULAR ENGLISH. From 1400 to 1460. Henry IV. V. VI. Cathedral at Gloucester, choir. Cathedral at Canterbury, nave. From 1460 to the close. Edward IV. to Henry VIII. Cathedral at Gloucester, Our Lady's chapel. Cathedral at Oxford, roof of choir. Cathedral at Winchester, exterior of choir. Cathedral at Windsor, St. George's chapel. Cathedral at Cambridge, King's College chapel. Cathedral at Westminster, Henry the Seventh's chapel. In the first arrangement of the styles, we have passed at once from the Pure Gothic to the Florid, omitting to describe the Ornamented Gothic, and Perpendicular English, which is introduced in our last mode of classification. 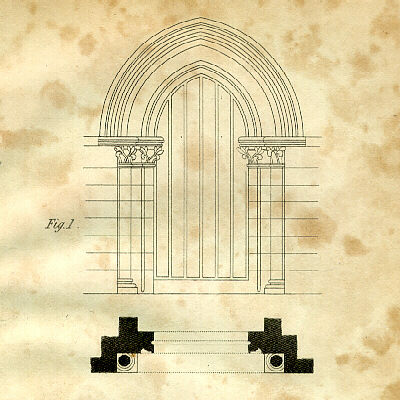 The arches were lower than in the preceding styles, and of a compound form, being generally struck from four centres; but what formed the most striking feature, was, that the mullions in the heads of windows, instead of being turned in curves and interwoven together, were chiefly carried up in perpendicular lines: the same was also observed in ornamental pannelling, which was much in use and the greater part of the screen and tabernacle work in the interior of English churches seems to belong to this or a later date.